This study of a flowering plant on a bold yellow ground is included in the "Small Clive Album", a volume of Indian paintings which is thought to have been given by Shuja ad-Daula, the Nawab of Avadh, to Lord Clive during his last visit to India in 1765-67. 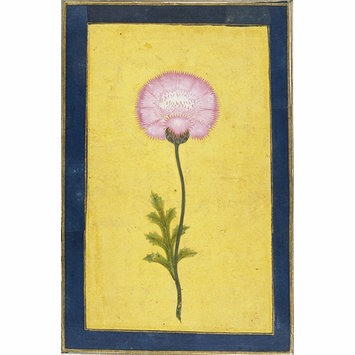 It contains 56 folios on which are Mughal paintings, drawings and flower studies dating to the 17th and 18th centuries. The binding is covered with an Indian brocade. The album was given to the museum by Mr John Goelet in 1956. 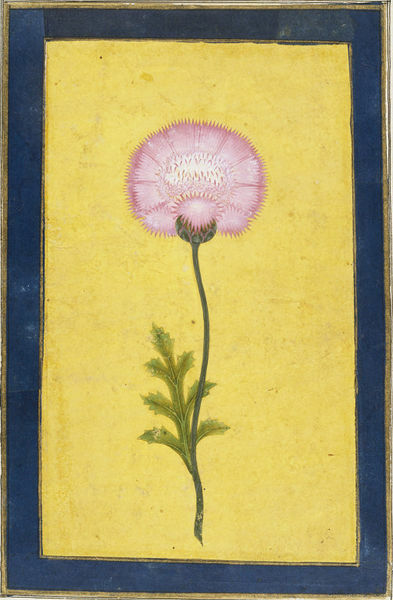 Painting, in opaque watercolour on paper, a stylised pink thistle flower on a single stem with a single serrated leaf is shown on a yellow background. The painting is mounted on a dark blue inner border edged in gold with black outlines on a plain ivory-coloured outer border which has strips of buff-coloured paper at the edges of the page with a gold inner margin outlined in black. A strip of beige woven textile has been added over the remains of the paper strip margin on the inner edge of the page to act as a gutter for the binding. This miniature painting is part of the Small Clive Album of Indian miniatures which is thought to have been given by Shuja ud-Daula, the Nawab of Avadh, to Lord Clive during his last visit to India in 1765-67. It contains 62 leaves on which are Mughal miniature paintings, drawing and flower studies on both sides. The binding is covered with an Indian brocade. The album was sold from Powis Castle at Sotheby's sale, 16-18 January 1956, lot 332A.